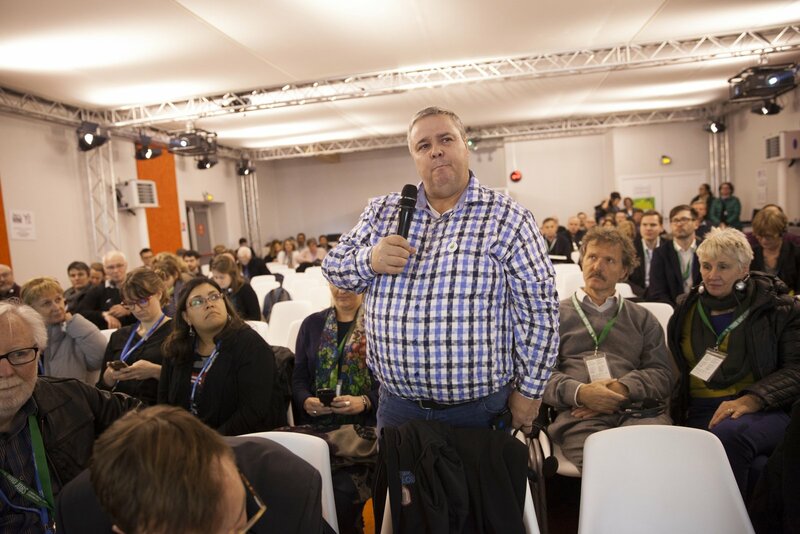 At COP21 in Paris, an oil sands worker from Alberta is urging a transition off of fossil fuels. Ken Smith, a 55-year-old Suncor heavy equipment mechanic and head of Unifor Local 707A, spoke about the need to protect the environment while also ensuring oil sands workers still have jobs and can provide for their daily needs. “We’re going to need some kind of transition. We’ve moved out there, we’ve invested in that industry —and when it ends, we’re going to be left holding the bag,” said Smith, who had relocated his family to Alberta from Bathurst, New Brunswick in 2013. Smith’s message comes amid news reports that suicide rates in Alberta had jumped 30 per cent in the wake of mounting job losses. Smith raised eyebrows in the room when he said he’s the union president for 3,500 oil workers in the heart of Alberta’s Big Oil country. Many workers’ attitudes have shifted, he said, and know climate change is real and dangerous. Smith’s voice brings an important perspective to the conversation. Some people assume oil and gas workers don’t care about the environment; others think that transitioning off of fossil fuels will inherently bring massive job losses. Smith’s argument proves that both of these positions are wrong, as we can transition in a just way. For more on the transition to a low-carbon economy here in BC, check out ACT’s work on the topic here. According to a new article posted in Nature Climate Change, global carbon dioxide emissions may be in decline for the first time in 15 years. “The study, which was the tenth of its kind published by this team of researchers, showed that CO2 emissions from the consumption of fossil fuel and cement production grew by a mere 0.6 percent in 2014, compared with 2.4 percent annual growth for the decade before. “We need innovation that gives us energy that’s cheaper than today’s hydrocarbon energy, that has zero CO2 emissions, and that’s as reliable as today’s overall energy system. And when you put all those requirements together, we need an energy miracle,”Bill Gates recently told The Atlantic. Luckily, what The Atlantic article called Gates’ “solo global lobbying campaign,” is starting to snowball. The political outcomes of the United Nations climate conference, COP21, may still be unknown, but at least we can expect substantial investment in clean energy following major announcements from earlier this week. Some of the world’s richest and most influential people committed to support the commercialization of clean energy ideas as part of the newly formed Breakthrough Energy Coalition. Meanwhile, over 20 countries will participate in Mission Innovation, a commitment to double their governmental and/or state-directed clean energy research and development investment over five years. Gates spearheaded the Coalition, and is joined by 26 other investors from 10 countries. Among them: Richard Branson, Founder of Virgin Group; Mark Zuckerberg, Founder and CEO of Facebook, and his wife, Dr. Priscilla Chan, CEO of The Primary School;Jeff Bezos, Founder and CEO of Amazon; Jack Ma, Founder and CEO of Alibaba Group; Marc Benioff, Founder and CEO of Salesforce; Reid Hoffman, Founder ofLinkedIn and Partner at Greylock; Mukesh Ambani, Chairman and Managing Director of Indian megacorp Reliance Industries Limited; Meg Whitman, CEO of Hewlett Packard; and Saudia Arabian HRH Prince Alwaleed bin Talal. Canada’s Environment and Climate Change Minister Catherine McKenna in Paris last week. Source: The National Observer; photo by Mychaylo Prystupa. In a surprising turn of events, last night in Paris Canada endorsed a commitment to 1.5 degrees Celcius as the limit for planetary warming. Previously, 2 degrees was the target being discussed. 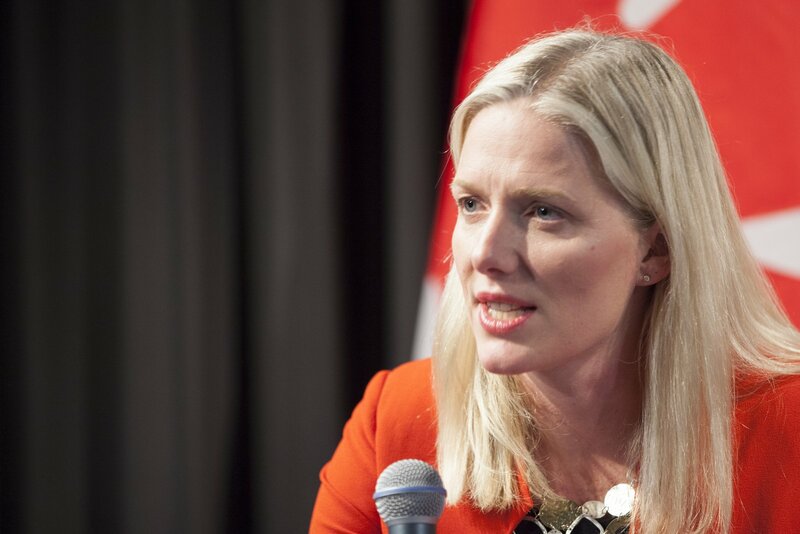 “Canada’s Environment and Climate Change Minister Catherine McKenna told a stunned crowd that she wants the Paris agreement to restrict planetary warming to just 1.5 Celsius warming —not two degrees. It was the first time she has made such a statement. Countries most at risk of climate change impacts, including Bangladesh, the Philippines, Sudan, and Vietnam, are pressuring other world leaders to cap climate warming at 1.5 degrees Celsius. As more than 140 world leaders made short opening statements on Sunday, 44 countries that are members of the Alliance of Small Island States (Aosis), along with other vulnerable countries, declared that the 2C goal being backed by all major blocs would seal the fate of hundreds of millions of people in countries like Bangladesh, the Philippines, Sudan and Vietnam. “Our members are particularly vulnerable to climate extremes and climate change impacts and we are acutely aware of the vanishingly little time remaining to adopt a legally binding climate treaty,” said Thoriq Ibrahim, environment and energy minister of the Maldives and chairman of Aosis. 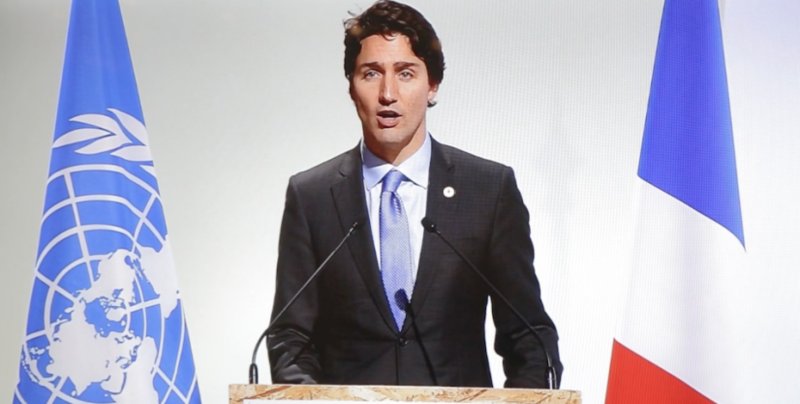 At the start of the COP21 meetings in Paris, Prime Minister Justin Trudeau made a strong statement about Canada’s role in taking climate action. Trudeau focused on five principles that will guide Canada’s climate policies: strong science, transitioning to a low-carbon economy (including carbon pricing), working with local governments including Indigenous leaders, helping the developing world tackle climate change, and viewing climate change as an opportunity for new ideas. Watch his speech and read more about it here. Throughout the next few weeks, many eyes will be on Trudeau to see how he brings these principles into practice on the world stage. Feast and Famine Workshop. Source: Partnership for Water Sustainability in BC. Ted van der Gulik, a former senior engineer in the Ministry of Agriculture who now is president of Partnership for Water Sustainability in B.C., said that protection of farmland — including from port-related development in South Delta — is far more important [than market gardens], along with finding ways to better use water and to bring more irrigation to lands not suitable for growing food. ACT Senior Water Adviser Bob Sandford was the keynote speaker at this event. 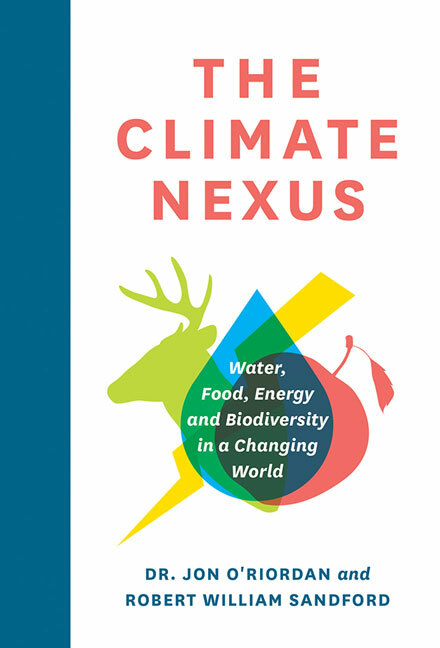 Bob is also co-author of ACT’s new book, “The Climate Nexus: Water, Food, Energy, and Biodiversity in a Changing World.” Join us to launch our new book tonight: Thursday December 3rd at 6:00 pm, Teck Gallery at SFU Harbour Centre, 515 W Hastings St. Separately, a second study of tens of thousands of British people’s daily eating habits shows that meat lovers’ diets cause double the climate-warming emissions of vegetarian diets. The study of British people’s diets was conducted by University of Oxford scientists and found that meat-rich diets – defined as more than 100g per day – resulted in 7.2kg of carbon dioxide emissions. In contrast, both vegetarian and fish-eating diets caused about 3.8kg of CO2 per day, while vegan diets produced only 2.9kg. 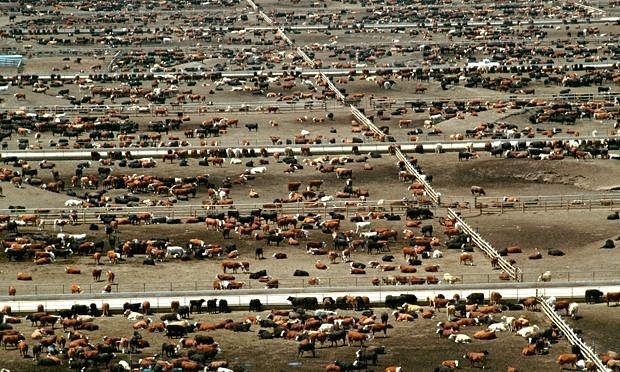 The research analysed the food eaten by 30,000 meat eaters, 16,000 vegetarians, 8,000 fish eaters and 2,000 vegans. Be sure to also check out ACT’s work on how crops and food supplies will be affected by climate change here in Canada. With the combined pressures of climate change and a growing population, finding ways to feed ourselves sustainably is a hot topic in climate change work right now. 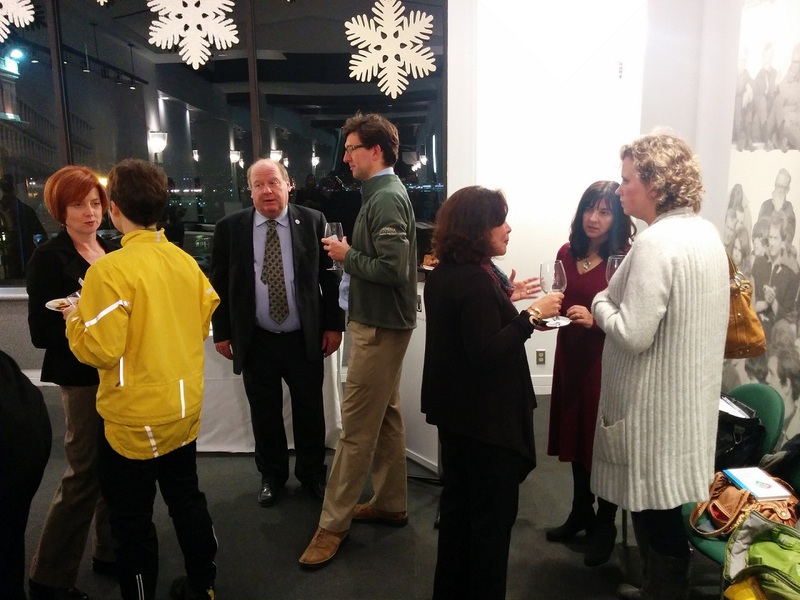 We held an event in Vancouver on December 3rd to launch this exciting book. This impending “perfect storm” of increasing demand, decreasing supplies and rapidly changing hydro-climatic conditions throughout the Nexus requires transformative policy responses that encompass economy, equity, social justice, fairness and the environment. This book outlines these challenges and offers a pathway to resolving them. Dr. Jon O’Riordan is a senior policy and research adviser to ACT and authored our Biodiversity report (2008). 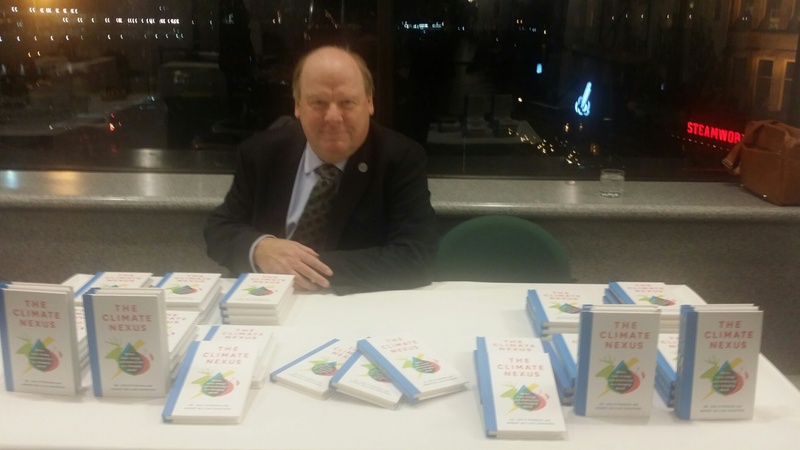 He has formerly served as deputy minister of sustainable resource management and as assistant deputy minister of environment in the British Columbia government. He is also the co-author of The Columbia River Treaty: A Primer (RMB, 2015). 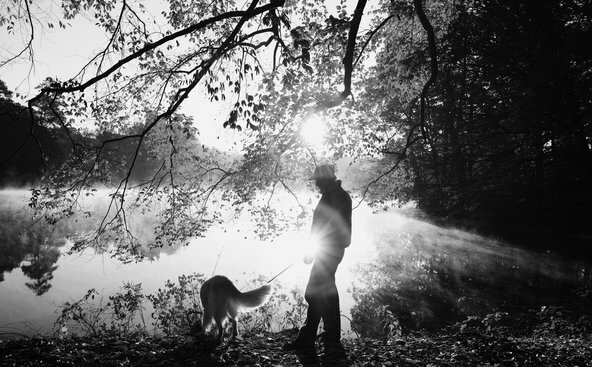 Robert William Sandford is a senior water adviser to ACT and authored our Water Governance report (2011). He is the author of some 20 books on the history, heritage and landscape of the Canadian Rockies, including Water, Weather and the Mountain West (RMB, 2007), The Weekender Effect: Hyperdevelopment in Mountain Towns (RMB, 2008), Restoring the Flow: Confronting the World’s Water Woes (RMB, 2009), Ethical Water: Learning to Value What Matters Most (RMB, 2011), Cold Matters: The State and Fate of Canada’s Fresh Water (RMB, 2012), Saving Lake Winnipeg (RMB, 2013), Flood Forecast: Climate Risk and Resiliency in Canada (RMB, 2014), and Storm Warning: Water and Climate Security in a Changing World (RMB, 2015). He is also the co-author of The Columbia River Treaty: A Primer (RMB, 2015). Robert lives in Canmore, Alberta. 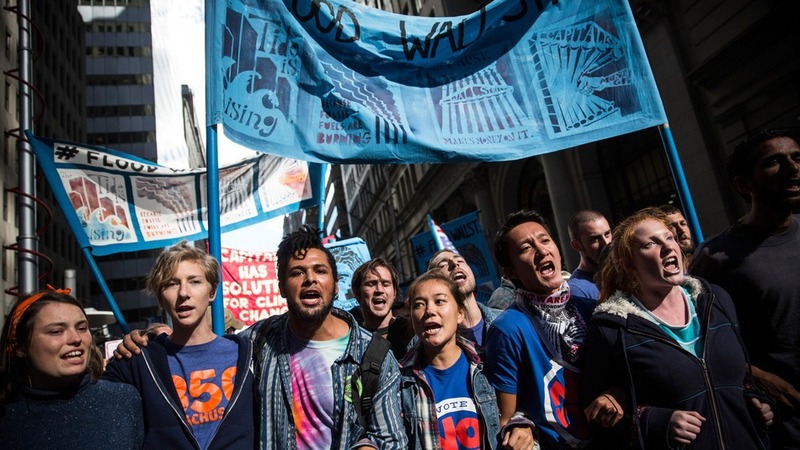 Activists participate in a climate march in New York City on Sept. 22, 2014. 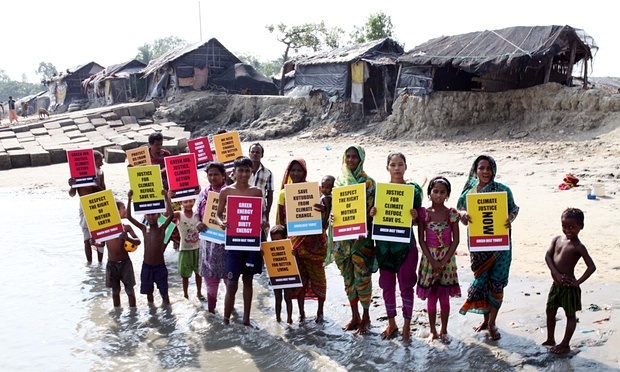 Climate change has long been a top issue on activist agendas around the world. But this month, conversations about real action and policy-driven change for the future of our planet are coming to a head. The U.N. Paris Climate Summit will begin on Nov. 30, bringing together 196 countries with the goal of drafting a comprehensive, realistic and enforceable agreement to tackle climate change. It will be a call to action for the global community, and is a prime opportunity to implement tangible solutions. Though similar summits happen annually, this year’s talks deserve particular attention. Global leaders, scientists and climate activists alike consider this summit the last chance to reach an agreement before “dangerous human interference with the climate system” becomes inevitable. To help curb this, climate advocates are calling for change — notably to drop emissions of greenhouse gases drastically within the next decade. Global leaders are listening, with many coming to the climate talks with the goal of implementing a zero or negative emissions global policy. These talks highlight a daily reality: Climate change is already having a serious impact on our lives and our planet, furthering inequality and making natural disasters more common and extremely devastating. With so much at stake, it’s essential to make your voice heard. Doing so during the high-level talks may seem nearly impossible for someone who isn’t a global leader, but there are still ways to get in on the action, even from afar. Continue reading to find out what you can do. What happens to coral reefs as the ocean warms and acidifies over the coming century? Corals might seem removed from human society, but in fact that not-so-simple question leads to an even scarier follow-up: What happens to us? Coral reefs are the richest ocean ecosystems we have — they support an estimated 25 percent of marine species. 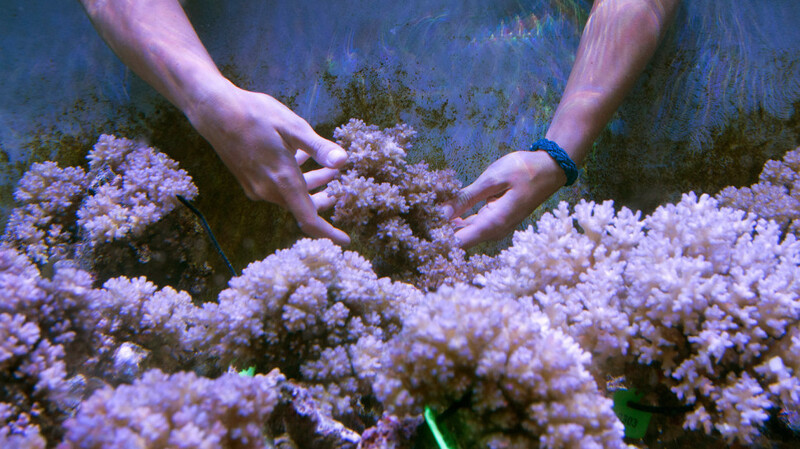 According to a 2014 report from the Food and Agriculture Organization, reefs are responsible for 17 percent of the protein we consume globally; in some coastal or island countries, like Sierra Leone or the Maldives, that number can be as high as 70 percent. Reefs serve as offshore larders, nurseries for important commercial fish (like tuna), and shelter for important ecological species (like sharks). They’re storm breaks for populated shores and bait for tourists whose dollars support entire local economies. We know that reefs are crucial to the oceans as we know them, and to our societies as we’ve made them — and we know they are in serious trouble. According to one 2000 report, we’ve lost 27 percent of coral worldwide, and stand to lose another 32 percent in the next 30 years. What we don’t know is if there’s anything we can do about it. Luckily, that won’t stop people from trying: Around the world, a scrappy handful of scientists, entrepreneurs, and volunteers are taking on this colossal problem, one branch at a time.From regrowing the reefs we’ve already lost to engineering new corals that may be able to survive hotter, more acidic seas, these innovators are fighting everything from nutrient pollution to overfishing to ocean warming itself. If we want to succeed, we might have to learn how to rebuild an entire ecosystem from the bottom up. 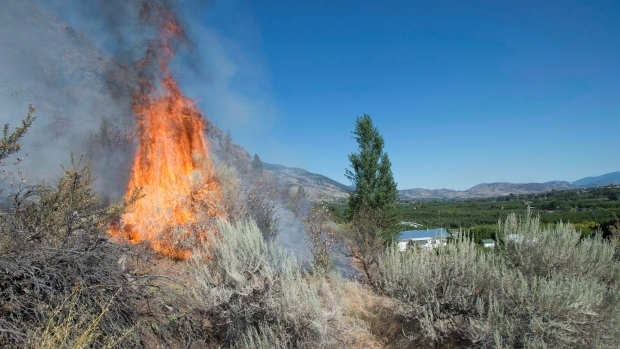 A wildfire near Oliver, BC in August 2015. Jonathan Hayward/Canadian Press. Source: CBC News. When Canadian federal, provincial, and territorial leaders gathered in Ottawa earlier this week, they were informed of some concerning news. “Alain Bourque, the executive director at Ouranos, a consortium on regional climatology and adaptation to climate change, told the first ministers an increase of two degrees in average temperatures globally could mean that Canada would see a change of about three to four degrees. With this news, Canada has even more of a responsibility to take serious climate action. Making strong commitments at the upcoming COP21 conference in Paris -and upholding these commitments- will be key. For more on extreme weather in Canada, read ACT’s work on the topic here. Jason Franson/The Canadian Press. Source: The Star. According to a new study by the EcoFiscal Commission, an independent coalition of Canadian economists, the majority of Canada’s economy would not be harmed if Canada had a carbon pricing scheme similar to British Columbia’s. 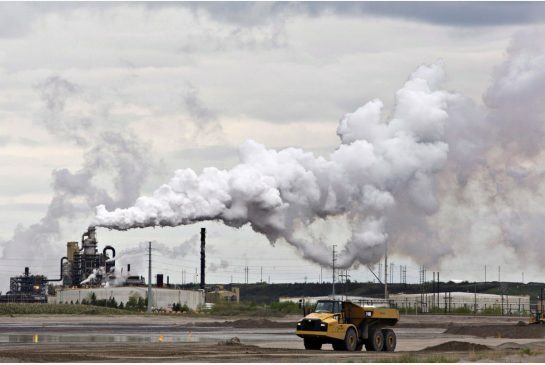 “Sectors representing about 95 per cent of Canada’s GDP would face little competitive pressure if a B.C.-style carbon price was applied in all provinces….Sectors that would take the biggest hit include steel, petrochemicals, fertilizer and refining. This is good news for those who are worried that carbon pricing will affect our economy on the whole. It is clear that we can take action on emissions through carbon pricing while maintaining a strong economy. The Collaborative Adaptation Research Initiative in Africa and Asia (CARIAA) is recruiting one professional development award recipient to undertake a 12 months paid program of research focusing on the development of a methodology to structure cross-project learning, and the identification of themes for synthesis at the programmatic-level, in the context of CARIAA. The position is based at IDRC’s head office in Ottawa, Canada. This call is open to Canadians residing in Canada and permanent residents of Canada pursuing doctoral studies at a Canadian university or having completed a doctoral program at a recognized university in the last 5 years. The candidates must demonstrate a specialization in climate change adaptation and experience in communicating research results on adaptation. Candidates must submit their application (resume, cover letter and research proposal) by December 10, 2015 to cariaa@idrc.ca. For more details, see attached document. Click here for further information in English and here for further information in French. The United States’ military strategy has long been predicated on being able to fight two wars at once. 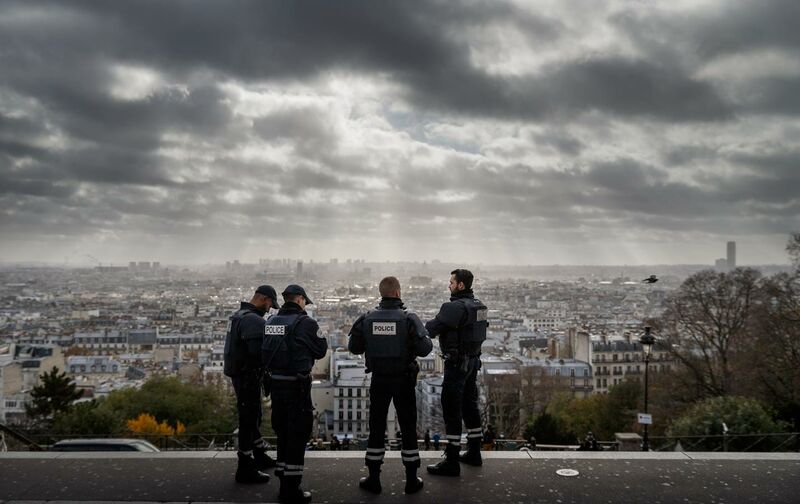 Now the horrific terrorist attacks in Paris, just weeks before the French capital hosts a landmark international climate-change summit, will test whether the world as a whole can address two crises at once. Massacring innocent civilians is never justified and calls for a range of responses: grief for the victims and their loved ones; solidarity with all who condemn such heinous acts; bringing to justice the immediate perpetrators; and unraveling the deeper causes of such violence. These necessities, however, must not be allowed to distract the world’s governments, media, or citizens from the equally urgent task of reversing our collective march toward climate chaos. Dooming young people and future generations (not to mention other species) to an unlivable planet is no more justified than killing innocent civilians is, and it too demands a range of responses, starting with compassion for the victims. Vermont Senator Bernie Sanders is correct to link the Syrian refugee crisis to climate change (as US national security officials and scientists have long done). ExxonMobil and other perpetrators of climate denial should be brought to justice. World leaders should agree in Paris to leave most of earth’s remaining fossil fuels in the ground, as the latest science dictates. Such a goal requires launching the most rapid possible transition to “100 percent clean energy for all,” as activists have urged. Humanity has the tools needed to exit the Carbon Age and build a sustainable future; what’s required are dramatically different political and economic choices.